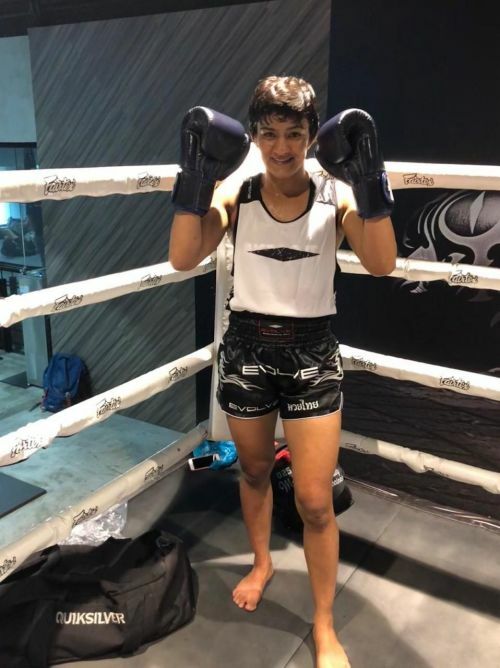 The Indian Freestyle Wrestling icon and Commonwealth gold medalist, Ritu Phogat had earlier announced her transition into the sport of MMA and her relocation into the Singapore based MMA super-camp EVOLVE MMA. Ritu Phogat's announcement had come across as one of the biggest news for the sport of MMA and MMA fans in India, as a celebrated Indian sports icon has finally made the transition into MMA. You can read more about the story here. Ritu Phogat and her management team had earlier broke the news of the wrestling star's transition into MMA and the sensational news was soon followed by ONE Championship's announcement of signing Ritu Phogat under contract for the Singapore based promotion. The news was broke out by Sportskeeda through an official press release of ONE Championship and you can read more about the story here. Recently, I had a chance to speak with Ritu Phogat and ask her about her transition into MMA and what the future holds for the wrestling star. Q: What was your main reason and motivation to make the transition from Wrestling to MMA and how long have you been considering this move? RP: I have been following MMA for a while now. MMA is a full-contact sport and initially, I thought it was staged like the WWE but then I learned that it is 100% real. From there on my interest grew further and I started following the athletes and their stories which were amazing. The idea of people competing from different fighting forms and battling it out was very captivating for me because as a kid I often used to wonder who is the strongest: a Wrestler, a Karate player or a Boxer? After many years competing in Wrestling and winning at the International and National stage, I always thought, what is next for me? Then as I mentioned, I started watching MMA and there was an itch as to whether I can do this? At that time, I started following it rigorously. Also, aggression is what I am known for even on the mat so I felt very close to the sport and then one fine day I was having a chat with Jitesh, my manager at Birbal Sports and Entertainment and I just happened to ask him: Is this possible, can I do this? That’s when it all started and finally, we have done it. Q: Have you ever learnt or practised any other form of martial arts except Wrestling before in your life? What kind of training will you undergo to transition into MMA? RP: No, Wrestling is all I have ever been training for. I am sure all of you know of my Dad (Mahavir Singh Phogat). Under his guidance, there was no other sport. There are a lot of special sessions I will have to undergo, right from Kick Boxing to Jiu-Jitsu to Muay Thai and other forms of Martial arts. One thing I am definitely confident about is my Wrestling and I will surely give my coaches a tough time about that. Q: Which martial arts are you and your team most focused on at this stage? RP: There are so many new forms and martial arts that I have been introduced to, here at EVOLVE MMA and it's unbelievable. There are masters in every form, world-class trainers and so many champions. It is super exciting! But right now my main focus is on Kickboxing and then I will be introduced to other forms gradually, at least that is what the plan is. Q: Many MMA fighters and experts have often said that Wrestling is the toughest martial art to practice and compete in and that Wrestlers make the best MMA fighters. Do you believe it to be true? RP: I hope so (chuckles). Looking at the recent results and the various champions, they all have a Wrestling background so yes it makes sense. But the main thing is how hard you train! No matter what it is, it's your hard work and training that defines your results. Q: What are your thoughts on Ronda Rousey, who came from an Olympic Judoka background? Is she someone that you aspire to be? RP: Not now, she has taken up pro-wrestling and moved to WWE. I followed her a lot during her MMA days. She was so powerful and dominant it is tough not to be a fan of hers. But I was quite sad to see her move out of the UFC. Q: ONE Championship has a unique rule-set and allows knees to be landed on a grounded opponent. With your Wrestling background, do you think that such a rule favours you? RP: I feel that Freestyle Wrestlers always have an advantage in MMA. Nevertheless, for any sport, training is the most important thing. If you train well and you learn different techniques of offence and defence, then you will be able to play and compete at the top-level. Q: When can we expect to see you compete for the first time? RP: I cannot wait! Actually, initially, I was a bit nervous and sceptical as to how will it be? But now that I have moved here (EVOLVE MMA), I am much more comfortable. My aim is to stay another couple of months and train at least, and then I shall hit the cage hard! Q: You used to compete at 48 kgs or 105 lbs in Wrestling, which is the Atomweight division in MMA. Are you going to compete at the same weight in MMA as well? RP: I have not decided that yet. That will happen in due course. For now, I am concentrating only on my training. Q: What message would you like to send out to all the Indian Wrestlers and specifically Female Wrestlers who might be interested in making the transition into MMA? RP: One should definitely explore MMA. It is an upcoming sport and I’m sure it will become big in India as well. Also right now my journey has just begun so I can’t give a lot of advice in terms of how to train and fight. But once you are focused you can go for it. If you want to achieve it, you can. I wanted to do it and my managers at Birbal Sports and Entertainment worked hard to get this for me and now, here I am. So yes. get good managers.